The occasional enchanting loon call across Bear Lake during the night and early morning echoed my feelings at this point of our trip: peaceful, a good kind of lonely, but sad because it was soon to be over. On the other hand, I had had enough cold to last a lifetime, and we both agreed that we did not want to see the inside of a tent again for a very, very long time. No matter how much you might like camping, spending time crammed in a tent with another person gets old eventually. I like my tent and my husband, but one absolutely can have too much of a good thing. We got up around 7:45, skipped breakfast, and packed up. Farmer John left before we had finished, and we said our good-byes before watching him amble down the trail, playing Simon and Garfunkel on his phone as he disappeared into the trees. We had just 3.4 miles to hike to reach our car at Silver Bay trailhead, which would end up taking about two hours, with constant steep climbs and descents and photographic distractions. After leaving our campsite, we quickly found ourselves emerging from the woods onto a rocky, open ridge above Bear Lake. It was a beautiful, crisp morning; the sky was a vivid fall blue, which provided a perfect backdrop for the distant moon looming high above us. We lingered above Bear Lake for a few minutes enjoying the picturesque view of the calm, blue water. Amazingly, it paled next to the view of its twin, Bean Lake. 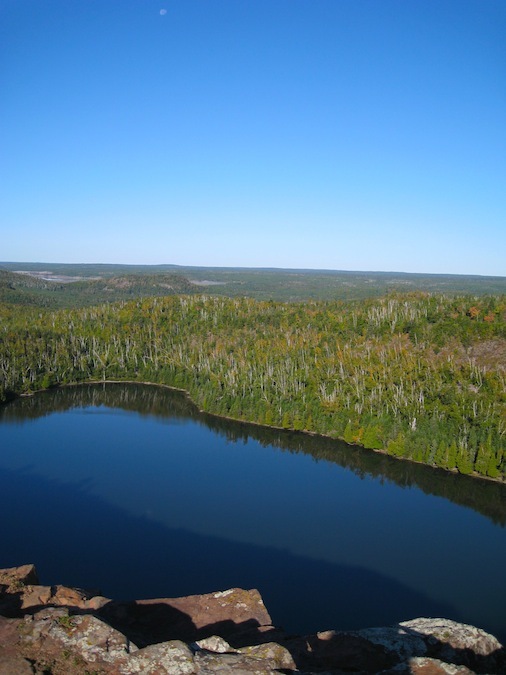 Just next door, Bean Lake lies far below a wide, flat, rocky outcrop, and the scene is spectacular. This was my favorite spot during the whole trip, and I could not tear myself away from the view of this gently curved lake, which shone like cobalt blue glass on this calm and clear morning. I was mesmerized by the combination of sights: the layers of reddish-brown rock forming the ledge I stood on, the smooth surface of the water, the green forest with its contrasting pillars of white birch, the striking blue sky, and the morning moon. It was nearly impossible to capture all of these elements in one photo – the lake was too wide to include the whole thing, the moon was very high in the sky, and the sun was directly behind me causing annoying shadows – and unfortunately I didn't think to take a video of the area at the time. If we hadn't been at the end of our trip and very much looking forward to driving to a town for as much breakfast as we could handle, I could have easily spent hours here. As it was, I had to be practically dragged away from this overlook. We reached the Silver Bay trailhead around 11:30 a.m., loaded our packs into the car, and got on the road in search of a restaurant still serving breakfast. We stopped at Northern Lights Restaurant in Beaver Bay, which has a gift shop in the front that sells jewelry and artwork by a local photographer. I ordered a huge plate of pancakes, and I have never eaten faster in my life. From there, we headed to Two Harbors to check out the Superior Hiking Trail Association office, where visitors can buy maps, t-shirts, and other trail-related stuff, as well as talk with the volunteers on staff. After that, we began the long drive home, once again stopping overnight in Marquette before making the final stretch downstate and back to our regular lives. Cool! 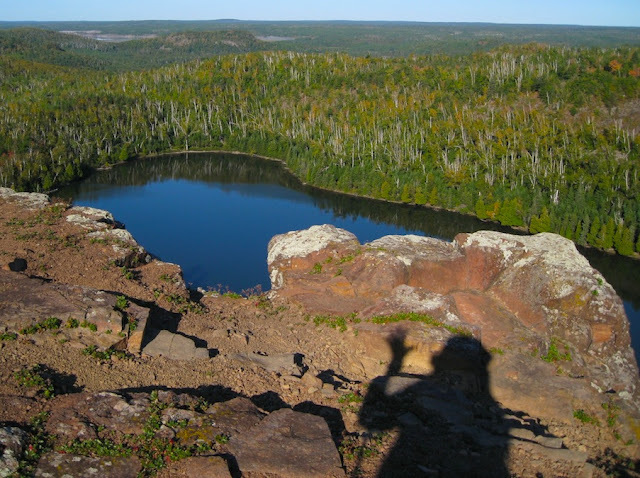 Those lakes look amazing -- tucked right in the middle of such steep cliffs. Thanks for the great series here -- I'm moving to Minnesota soon and I'm really looking forward to trying out the SHT. Nooooo! Leaving Northern Michigan?! I admit that I really liked Duluth and wouldn't mind living there. What part of MN are you moving to? Yeah, I agree -- it'll be hard! I have a faculty position at U of M in the twin cities. So, I'll have to plan my outdoor adventures a bit further in advance.